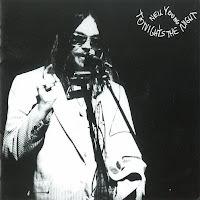 Frequent visitors to this blog know that I submitted a proposal, on Neil Young’s Tonight’s the Night, to Continuum Books’ 33 1/3 series of books on significant rock albums of the past forty years (or so). This past Sunday evening, the series’ editor, David Barker, posted the (long) shortlist of proposals still under serious consideration, trimming the number of proposals from 597 to 170. I’m very happy to report that my proposal made the initial cut and is still under consideration, as is my friend Tim Lucas’s, on Jefferson Airplane’s Crown of Creation. Tim sent me a congratulatory note today, to which I responded reciprocally. I sincerely hope we both make it—I would very much like to see our work appearing in the same series— although I don’t wish to calculate the odds of that probability. But we shall see. While reader comments (available on a pop-up window) on the short list are widely varied, by and large the comments by those authors whose proposals were rejected the first round are congenial and supportive of those who made the initial cut. Believe me, I know what it’s like to receive a rejection, as I didn’t make the cut the last time there was an invitation for proposals, nor did Tim. While of course I would love to contribute a book to the series, there are a good many albums on the short list I would love to read a book about. Congratulations to all who have made it so far. I wish you all the best, and please do likewise.